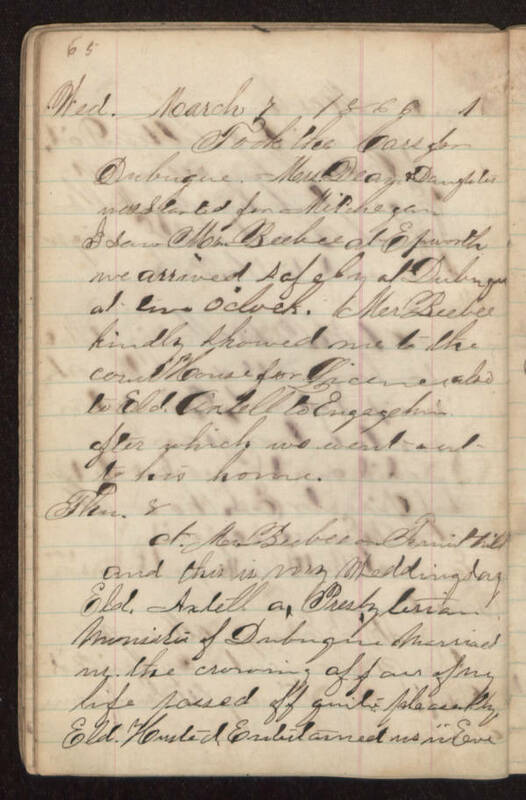 Wed. March 7 1866 Took the cars for Dubuque. Mrs Deay Daughter was started for Michigan I saw Mr Beebee at Epworth we arrived safely at Dubuque at two o'clock. Mr. Beebee kindly showed me to the court house for license also to Eld. Axtell to engage him after which we went out to his home. Thu 8 At Mr Beebee on Fruit hill and this is my wedding day Eld. Axtell a Presbyterian Minister of Dubuque married us the crowning affair of my life passed off quite pleasantly Eld. Husted entertained us in eve .